I recently wrote about powering up blogs by adding video, audio and GIFs. Another form of content which you can add is an interactive map by embedding a Google My Map. Google Maps has been a staple of Google’s applications for a long time. 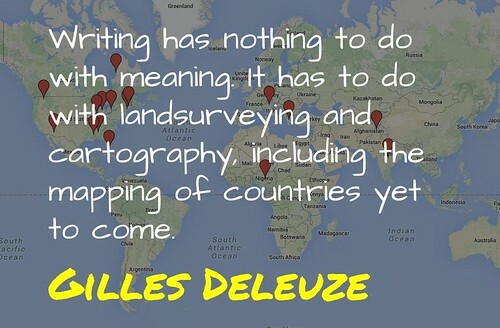 However, something that is often overlooked is the potential of creating your own maps. In the past, the place people often went was Google Earth, using features such as Tour Builder, while more recently Maps Engine Lite offered a way of customising traditional Google Maps. One significant changes in rebadging Maps Engine Lite as My Maps has been to house the files within Google Drive. This has made it easier to create, collaborate and share various creations of space. You are able to easily make layers, add place marks, draw shapes and create directions. To take this to the next step, you can also import information via a spreadsheet. Uploading can be good if you have a long list of coordinates. While you can also export data from My Maps as a KML file. This can be useful if you want to add information into Google Earth. In addition to this, you can add content to the place marks or shapes, whether this be a description, image and video. This then comes up when you click on the marker. In addition to this, you can also change the place marker icon and colour of the shape. Therefore giving you with another layer of meaning. What is good about My Maps is that it provides a different way for communicating information and telling a story. So what about you, how could you use My Maps? As always, comments welcome. 5 Easy Steps to Design the Google MyMaps Lesson of Your Dreams – A list of tips and tricks associated with using My Maps, including links to a range of examples. Google My Maps – Jim Sill provides a good introduction to the various terms and constraints associated with using My Maps. Exploring Your World with My Maps – A short guide from Chris Betcher with ideas and activities associated with using My Maps. Where’s Odysseus? – An activity involving the mapping of the Odyssey. Creating and Telling Stories With Maps – Richard Byrne collects together some of the stories that students can tell with digital maps. Making My Own Maps with GSuite by Aaron Davis is licensed under a Creative Commons Attribution-ShareAlike 4.0 International License.